Doctor Paist first became interested in optometry early in high school. He was always intrigued by all of the neat "toys" that his optometrist used. Also, he learned that as an optometrist you were not only able to help somebody see better, but you could also detect various diseases, such as diabetes, by just looking into the eye. Dr. Paist graduated from Boyertown High School in 1993 and started his college career at Bloomsburg University located in Pennsylvania. 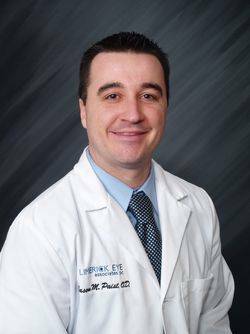 While in college, Doctor Paist did several internships at an optometric practice in Bloomsburg, and he also worked at a private practice while on summer and winter breaks. In 1997, Dr. Paist graduated from Bloomsburg with a Bachelor of Science in Biology. He stayed at Bloomsburg another semester to take a graduate-level anatomy and physiology course. In 1998, Doctor Paist was accepted into the Pennsylvania College of Optomerty located in Elkins Park, Pa. In 2002, he received his Doctorate in Optometry. Dr. Paist graduated in the top twenty-five percent of his class, along with receiving clinical honors. Doctor Paist returned back to his hometown after graduating optometry school and immediately got a job in private practice. Five years later, Dr. Paist fulfilled his dream of opening his own practice in Limerick, PA. His goal is to provide thorough, personal care along with exceptional customer service. When Dr. Paist isn't at the office, he enjoys spending time with his wife, Tracey, and their son, Collin along with their "furry" son, Cody.